ON JANUARY 10, Nicolas Maduro started his second term as president of Venezuela. The political drama behind his rigged re-election, the economic collapse of the country and the traumatisation of the society resemble the story of One Hundred Years of Solitude by Gabriel Garcia Marquez. The Venezuelan reality, however, is even more bizarre than the magical realism in the Marquez novel. Venezuela has the largest oil reserves in the world, even more than that of Saudi Arabia. Besides oil, the country is blessed with minerals, hydroelectric potential, arable land, a pleasant climate and beautiful beaches. In the 1960s, Venezuela's per capita GDP was much higher than that of Brazil and Colombia. Venezuelan capital Caracas was the only destination for Concorde flights in Latin America. On weekends, the Venezuelan middle class used to go to Miami for shopping. The country was a vibrant democracy, while many countries in the region languished under military rule. Since then, most of Latin America has moved on with a new paradigm of democratic maturity and economic growth, while Venezuela has gone backwards with a toxic combination of authoritarianism, political chaos, economic disaster, hyperinflation, shortage of food and medicine, rampant crime and corruption. The Chavistas, the followers of former president, the late Hugo Chavez, have given a bad name to socialism. Under Maduro, Venezuela's GDP has contracted by over 50 per cent. The country has the highest inflation rate in the world, running into six digits. With manufacturing and agriculture in a shambles, the country depends on imports. But, there is a severe shortage of foreign exchange, hampering imports. The Venezuelan bolivar is worthless, and it has led to the rise of a huge black-market run by Chavistas. Poor people scavenge for food in rubbish bins. Queues are common in front of supermarkets and shops, which are often empty. There are frequent power cuts and shortage of water. Most international airlines have stopped flights to Venezuela because of payment issues. Crime and violence are rampant in Caracas, which has become unsafe even for diplomats. 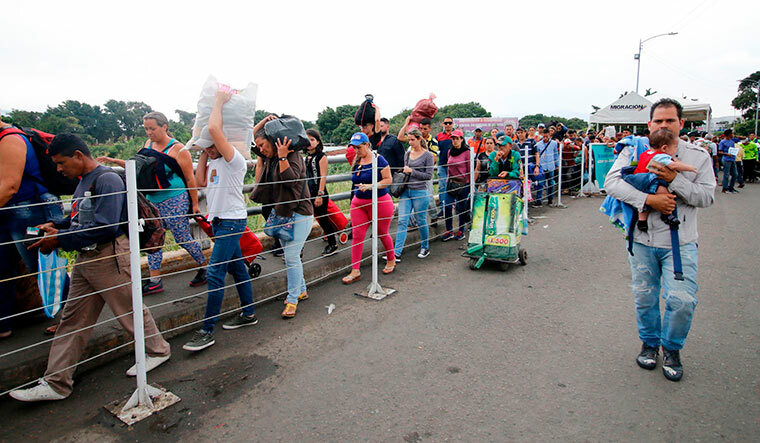 Three million Venezuelans (10 per cent of the total population) have fled to other countries. The country’s oil production has come down from three million barrels per day to 1.5 million barrels, because of mismanagement and lack of investment. PDVSA, the state oil company, which had the best oil experts and managers in the region, is run by unprofessional Chavistas these days. Maduro’s re-election has not been recognised by the Venezuelan opposition. The snap election was called prematurely by an illegal constituent assembly which usurped the powers of the legitimate Congress in which the opposition had the majority. The opposition is now led by Juan Guaido, who is the new head of the Congress. The Venezuelan opposition, however, seems to have run out of steam and looks divided. It tried dialogue with the government through the mediation of the Vatican. This, too, failed. There is no possibility of any recovery under Maduro, who is simply incompetent. He has, however, ensured the support of the military by giving it control of lucrative businesses such as food distribution and the petroleum sector. The Chavistas and their military collaborators continue to plunder the country. Chavez, a long-time admirer of the late Cuban leader Fidel Castro, nominated Maduro as his successor from his deathbed in Havana, on the advice of the Castros. The Cubans have been helping the Chavista regime with intelligence inputs through their advisers in Venezuela. They guide Maduro on how to survive American conspiracies and sanctions, based on their long experience. There are thousands of Cuban doctors who work in the slums of Venezuela, who act as the eyes and ears of the Chavista government. In return, Cuba gets Venezuelan oil on generous terms. The twelve Latin American countries of the Lima Group, which include Brazil, Argentina and Colombia, have condemned Maduro's rigged re-election and refused recognition to his government. The US, Canada and the European Union, too, have followed suit. They have threatened sanctions and restrictions to further isolate Venezuela. But Maduro receives some support from China, Russia and Turkey as well as from Bolivia, Nicaragua, El Salvador and Mexico. The Maduro regime would collapse if the US imposes oil sanctions. The US, which is the largest importer of Venezuelan oil, can afford to forgo it thanks to the shale revolution. But the US administration does not want to cause losses to a few American refineries which only use Venezuelan crude. The US is not in a hurry to step in as it feels that Venezuela’s collapse would serve as an example against the spread of socialism in Latin America. India is the second largest importer of Venezuelan oil, with imports worth $5.85 billion in 2017-18. It is part of India's strategic energy policy, aimed at reducing dependence on the Middle East. The ONGC Videsh Ltd (OVL) has invested over a billion dollars in Venezuela. Subsequently, India does not comment on Venezuelan politics and maintains pragmatic ties with the Maduro government.